If you have different blogs in the same Blogger account, you will have the same profile for all the different blogs. Some have tried to get around this by inviting himself to a blog, and then trying to remove the "original" owner, but that is not allowed by Blogger. The above is for the blog Generating Revenue from your Website and it tells me that the width of the sidebar is 150 pixels wide. A blog reader asked how to make the profile open in a new window. For that you will have to use hyperlink like this <a href="URL of profile" target="_blank"><img src="profile photo URL" width="W"><'center>Write something about yourself></a>. The URL profile may be the actual profile of a blog or a post/blog about yourself. I think I will give an illustration of this by creating one for demonstration. Check out this blog: Alternative Medicine. It is at the bottom of the left sidebar. I have used this technique to create a "All About Me" profile which when clicked take you to the full profile. Note that in the "All About Me", there are some clickable links. which tells me the sidebar is 150 pixels wide. So I have to put the attribute width="145" into the <img> tag. Of course you have to change the URL of the specially made profile page, the photo URL and the text in the HTML to suit your own situation. Acknowledgement: This post is the result of a comment by ~HJ of ~HJ's profile in my post How to have different profiles in the same Blogger account (click "BACK" button to get back to this page). 2. Manual method. Open each post in the EDIT HTML mode, copy and paste the content into Notepad and save it somewhere safe and easily accessible. 3. Use HTTrack. I have tested using HTTrack and as I expected, it works for both blogs using old classic templates and New Blogger templates. I expected it to work because it mirrors Webpages which does not depend on how the Webpage was created. If you use HTTrack to backup your blog, you can even burn the mirrored site onto a CD and send it to other to view, etc. I you use the Internet just for reading and sending emails, a dial-up connection is probably sufficient for you. However, with the introduction of VoIP, embedded audio and video, video conferencing, high definition TV, etc. a dial-up definitely will not do. I you upload photos to your blog, you will need broadband. What is broadband? A UK Broadband Provider has three pages Broadband Guide, What is broadband and Fast Broadband explaining what broadband is all about, the equipment you need and how to fix it up. There is also a page to explain about Wireless Broadband. BroadbandSupplies.co.uk has lots of information on its site for residents of UK. For example, they have reviews of various broadband providers like BT Broadband, Virgin Broadband, etc. There is also a page on Special Offers and Advice on how to compare Broadband Providers. Update: As of November 15 2009, Bubbleshare.com will no longer be available. I tested putting up an album and the result is here: Malaysia, truly Asia. The steps to create the album is there. There is also a provision to add audio, but I didn't try it out. UPDATE 14 August 2009: From 15 November 2009, BubbleShare will be no more and all photos stored there will be deleted. If you have any photos there, you better go there and download all your photos into your computer and find a different file host. into the address bar and press enter). Even big websites with very knowledgeable webmaster like BBC News uses a template which take into consideration visitors with small screens. If you visit BBC News with a large screen, you will probably also see blank "wasted" space on your screen, just like this blog. If I use other templates, visitors with small screen may be forced to scroll horizontally to see the rest of the right side of the blog if I use a fixed width wider format template, or the main column or sidebars may be squeezed into narrow columns if I use a fluid width template. Also, with a fluid width template, I have to be careful to make sure the width of images, scroll boxes, tables, etc, will fit into the narrow columns when such visitors visit my sites. Otherwise, they may find the sidebar or main column pushed to the bottom of the page or see other problems. The writer of this site max-width in Internet Explorer recommend that that a good reading width, should be around 60 CPL (characters per line), which is approximately the CPL of the main column of this blog, using Ramani's fixed width 3 column New Blogger template. His recommendation is based on a readability study done by the department of psychology at Wichita State University, entitled The Effects of Line Length on Children and Adults’ Online Reading Performance. Some may find this blog very plain with very little graphic and colors. This is my choice. I do not have to worry about hosting graphics, especially if the graphics for the templates are hosted by someone else. If those graphics disappear from the web, the blogs using those fanciful templates with lots of graphics will have big problems. The solution is of course to host the graphics yourself, but you mus know how to do it. This will probably be discussed in another post. Also, I don't want visitors to be distracted by graphics but I just want to focus on the content. However, some bloggers may not like the empty wide spaces on both sides of this blog when viewing with larger screen resolutions such as 1024x768, 1152x864, etc. For them, they may choose fluid width templates which will adjust the width of the main column according to the screen resolution of the blog visitors (note the reference to width of photos, scroll boxes, etc. above) or use fixed width wider format templates if they don't mind forcing small screen visitors having to scroll horizontally to see the rest of the side of the blog. You can find New Blogger templates modified or created by third parties at New Blogger templates (mostly 3 columns), tested with demonstration and test blogs. This will be updated as I keep adding new templates as time permits. To help build traffic to your website, it is always good to let visitors have an easy way to subscribe to feeds to be kept updated on new posts in your blog. In this way, visitors using a suitable feed reader can keep an eye on your blog for new post, and visit your blog when they see something interesting or useful. Social bookmarking now is also very important to help building traffic. The problem is there are a multitudes of social bookmarking services and feed readers. I have written a previous post on an easy way to social bookmarking for your blog at Easy social bookmarking for your Website (click "BACK" button to get back to this page. A reader of my blog alerted me to a similar service AddToAny. The advantage of AddToAny is that it is very easy to use. The advantage/disadvantage (depending on how you look at ot is that you don't need to register for an account. This also means you have no way of finding out how many people are subscribed to your feed. I have previously published a post How to backup your blog in which BlogCollector and HTTrack was mentioned as one of many methods to backup your blog. Recently, someone asked a question about BlogCollector, saying he couldn't get BlogCollector to work. Since I haven't used BlogCollector after New Blogger templates was introduced, I decided to make some tests. I used BlogCollector to try to backup Testing Blogger Beta which is a blog using a New Blogger template in a New Blogger account. BlogCollector failed to backup this blog. I tried BlogCollector on Blogger for Dummies which is also in a New Blogger account, but still using the old classic template. The backup was successful, backing up all the 60 posts in the blog. So the conclusion is that you can use BlogCollector for blogs using the old classic Blogger template, but not for the New Blogger template. For that, you will have to use HTTrack or other methods. Update 9 August 2007: This update should have been updated earlier, but BlogCollector has already been updated to backup New Blogger blogs. However, I haven't really have time to test it but I think it still can backup photos. The best way to backup blogs is to do the tedious manual method by editing each post in the EDIT HTML mode, save the content of the post in a Notepad file and save them one by one, but it is a lot of work. Which search engine do you normally use for your searches? Google? Well, there is a new innovative soon to be launched search engine Megaglobe which uses a new patent pending technology called "pay per valid click". Google AdSense is having problems dealing with invalid clicks (defined by them as clicks generated through prohibited methods. These prohibited methods include but are not limited to: repeated manual clicks, or the use of robots, automated clicking tools, or other deceptive software. Invalid clicks also include clicks by the publisher clicking on ads on his own site or asking or encouraging others to click on the ads. If found out, such publisher will get their account suspended. Invalid clicks are a major headache for Google AdSense and their advertisers. If this new "Pay per valid click" technology by Megaglobe works, it will give Google AdSense stiff competition as it may attract advertisers who are put off by invalid clicks to switch to Megaglobe. In addition to the new "Pay per valid click" technology, another feature which may induce advertisers to switch to Megaglobe is that it will be available in 50 currencies. Also, Megaglobe is a member of the prestigious Interactive Advertising Bureau (IAB), which include among its members Google, Yahoo! and MSN. In addition to this "Pay per valid click" technology, Megaglobe will be available in 45 different languages. Well, we will be able to see how good Megaglobe when it is launched, which is expected to be soon. One more thing for webmasters (which include all bloggers). Do not wait for Megaglobe to be launched. They are allowing webmasters to add their websites. I have added all my blogs to Megaglobe. Re-connect with your past through a People Search Engine. It's a fast and easy process to Search For People and locate lost friends. Search through Public Records to find out what a People Search can uncover. The Web is constantly changing and it requires an adaptive mind to keep up. Whether you are someone looking for more education or pursuing a career in teaching within the technological field, a masters in educational technology is a great first step to take in the right direction. Here is another easy way for you to add music to your blog. Go to eSnips. There you can upload your music file and other files like videos, photos and files. Here we will just be discussing music, but videos, etc., should be no different. You can check out this post where I have used eSnips to embed a music player into the post: Testing embedding own music in post. Update: eSnips.com have been inaccessible for some time. An alternative is to convert Youtube video to mp3 then embed an mp3 player for music in your blog. This app makes converting video easy. The default is to only play the music if a visitor click on the Play button. However, you can make the player play the music automatically the moment the page opens by choosing Yes in the Auto Play drop down menu at the bottom of the preview page (see bottom of the screenshot above). This setting (autoplay) is not favoured by many because of fear of unwanted interruption like when a person is surfing at night and there is a baby sleeping nearby. The person will have to quickly exit the site to stop the music playing. That is why the default is set to "no". Update March 16 2007: Got a tip about Odeo from Brad of Brad Linder's Digital Home. I tested embeding a selection into this post Testing embeding musical from Odeo. However, unlike eSnip, they don't give you the option of whether you want autostart or you need the visitor to click the "play" button to play the music. In this case, a visitor will have to click the "play" button to start the music. UPDATE 5 November 2007: See eSnip music player in sidebar for instructions on how to make the eSnip player fit the sidebar (click BACK button to get back to this page). Not satisfied with just putting music on your own site. Like to listen to music on other sites online? and even you can Stream Music on your own website. Adding a MP3 Player to your blog. (click the "BACK" button to return to this page). Got a tip about a site offering free and paid pixel advertisements from Advertisement for blogs, so I decided to do some investigation. I found that site that offer both free and paid image (pixels) ads for blogs, with the free ad limited to 60x20. you can find the link to the free pixel ads site below as it is a condition I provide a backlink to them in exchange for a free pixel ad. Now with AddThis, you can get just a single icon to put on your blog or website, and a visitor clicking on the single icon will get to a page where he can choose whatever social bookmarking service or services he is subscribing to. 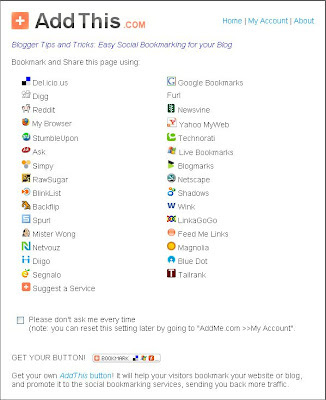 I have added AddThis icon for both the blog as well as the individual posts of this blog: Dummies Guide to Google Blogger. You can pop over to that site and test them out. Where? Drop-down menu: "on a Blog"
Blogging Platform: Drop-down menu: chose "Blogger"
Want stats with that? tick "Yes"
Click "Get Your Free Button"
Note: The codes here are for illustration purposes only. You should get the codes direct from your own account in AddThis as otherwise, you will not be able to see the statistics as it will enter my account instead. Preview, and if satisfied, save the template. Update 14 March 2007: I find it so useful, I think I will add them to this blog as well. 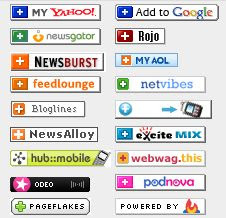 from which you can select a whole range of social bookmarking services. Try clicking on the icon just below this post or the icon at the top or the left sidebar and see what happen. Perhaps the easiest way to describe how to add an image or logo on the side of the blog Header is to describe step-by-step how I got to display the photo of a baby at the side of the Header of this blog: Baby Center - everything about baby care. That tells me the Header is 750 pixels wide, so I set the width of the New (empty Image to be 745px and the height to a suitable figure. I clicked on the "Background Color" button and selected white as the background color of the empty image I am going to create. When I am done, I clicked OK and I will be presented with an empty image (without that box with black border). Using the mouse, I "click, dragged and dropped a box where I want the photo to be pasted in and below is the screenshot of what I ended up with. Note that by doing it this way (adding the image as a background), I do not have to delete the text Title of the blog, which I am of the opinion is important to preserve as the Title figures prominently in determining what your blog is all about. I don't think incorporating a graphic Title into the graphic image, then getting rid of the text Title is a good idea from the SEO (Search Engine Optimization) point of view. 5 July 2007: When I set up the Google group Photo Store, it was set up as a private group without me knowing. I tested this method and could view the baby photo (logo) at the left side of the Header without problem. That was because I was signed into the Google account which was used to set up the Google group. What I didn't realise was others who are not members of the Google group would not be able to see the baby photo (logo). Many must have read this post and viewed that blog Baby Center - everything about baby care, but no one bothered to comment to alert me. It was only today when I was using another browser in which I was not signed into that Google account and checked that blog. I was shocked to see that the baby photo (logo) wasn't visible! I now took time to upload the photo into Photo for Baby Center blog and used the URL of the uploaded photo to replace the one in the Google group. The baby photo (logo) should now be visible to everyone. My only regret is those who spotted the problem did not bother to alert me. anywhere between the <head> and </head> tags in the template. There are frequent complaints of bloggers using the Blogger platform for their blogs not being able to see the toolbar (containing the tool icons for making text bold or italic, for making a hyperlink, for spell checking, and for uploading photos) and/or cannot see the EDIT HTML/COMPOSE tabs in the post editor. This too has happened to me before, and what I do is to use a different browser (see What to do when you can't publish post, upload photos, log-in, etc. and Why you should be using more than one browser (click "BACK" button to get back to this page). Other things you can try is to refresh the page, clear cache and cookies or press Ctrl + F5 keys. You can see the screenshots of my blog Blogger Tips and Tricks at Browsershots of Blogger Tips and Tricks. How to change the color of the blog background, text in the content, etc. First, choose what your want to change in the left side of the page, then preferably select a color from the blocks of color to the left. You should preferably select colors that matches your blog or colors from your blog. Be careful if you are choosing color for the font, not to choose a color that matches the background, or choosing a corlor for the background not to choose a color that matches the font. That will make the text invisible, making your blog unreadable. Worst, it can get your blog black listed by the search engine as that is considered black hat SEO (Search Engine Optimization). If those colors mentioned doesn't satisfy you, that are other color further to the right. You can also input the exact HTML code for the color you want. 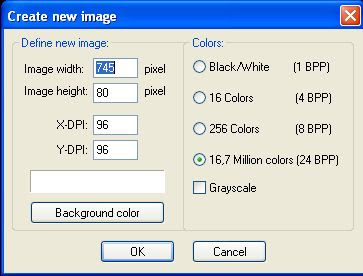 For this task, getting the very useful ColorPic will be very helpful. If you are trying to get the HTML color code for the link on your site, it is best to make a screenshot (press "Printscreen" key, then paste it into the Paint program available in Windows in the Accessories, or use my favourite - the free Irfanview). You have to use an image of your page because most links change in color the moment you place your mouse over it, but with a screenshot, that doesn't happen. Do you have some useful skills in Web design, Web applications, Database Web applications, Desktop software and applications, Animation and graphics, Audio and video, E-commerce related skills, Handhelds and PDAs, Mobile applications, Online marketing and Search Engine Optimization, Support and administration, Accounting and Finance, Data Entry, etc., and you have some spare time. If so, you should consider registering as a Service Provider at SupportUniverseTM and bid for projects related to your skills. There is an activation fee of USD11.95, but for the moment, if you provide a link to their site from yours, the activation fee can be waived. You can register here at Freelance Programmers Marketplace. You will get a request for a USD11.95 activation fee, but you can ignore it and reply with a link to the site where you have linked to them. At the moment, there are Audit Program Management project and Customer Relationship Management system projects for you to bid for. I expect there will be more projects as more project managers get to know about SupportUniverseTM. Once you successfully bid for a project, the Project Owner will pay the agreed amount to SupportUniverseTM in escrow, and you will start working on the project and will have to complete the project within the specified time frame. When the project is completed, the Project Owner will examine to see if the work done is to specifications, and if satisfied, the amount will be paid to you less 7% or USD5 whichever is higher. If the Project Owner is not satisfied, SupportUniverseTM will act as a mediator to determine if the project is done to specification, and will decide pay you or refund the amount to the Project Owner. If you have work to be outsourced, you can also register as a Project Owner at Freelance Programmers Marketplace. There is absolutely no fee payable for Project Owners. The New Blogger has recently rolled out its latest feature - custom domain. With custom domain, you can have your own domain name like myblog.com and have your blog hosted with Blogger for free. You may also choose to host your blog with a third party web host or even on your own, but you will have to grapple with various issues like the hassle of publishing your posts via FTP (File Transfer Protocol). A big disadvantage of hosting on your own is that many of the new features of the New Blogger like drag-and-drop Layout, Label List, etc., will not be available to you as you will have to use the old classic Blogger template. Others who don't use custom domain will have to live with sub-domain like myblog.blogspot.com. Some don't like it because they say the sub-domain does not belong to them, but to Blogger. In addition, some are of the opinion that sub-domain are command less respect from surfers, rather like using a home as an office. If you want to use custom domain, the first thing you need is to register a suitable domain name. The problem is, the Internet has been with us for quite some time already, and many of the more desirable domain names have probably been already taken. This is where services like www.buydomains.com can come in handy. www.buydomains.com have many domain desirable domain names that you may want to use for your blog. There is a search box into which you can type in keyword/s and search for your desired domain name. They also have Advanced Search to help you narrow down the search. If you have a domain name which you think may be saleable, you can also put up the domain for sale through www.buydomains.com. You may also start a blog with custom domain (which means that the domain belongs to you, and not to blogger, and you may do whatever you want with it). You take care to choose a desirable domain name with good keywords in the URL, publish posts regularly, get the blog indexed by search engine, and get a high PageRank which will make your domain name more valuable. You may even join the Google AdSense Program and put contextual ads, search boxes and referral links on your blog and work on it to produce revenue. There may be people who are looking for AdSense ready blogs to buy as then they can start earning straight away rather than starting from scratch.